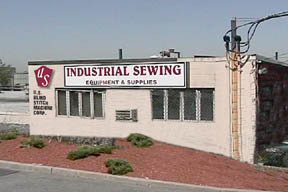 U.S. Blindstitch Machine Company, acquired by New York Sewing Machine Corp. in 1995, has a complete line of both new and rebuilt U.S. Blindstitch Machines. Over 50 specialty machines are available for Men's Wear, Women's Wear, Active and Casual Wear, Formal Wear, Heavy Duty Industrial Rental Wear, Interior Textiles, Drycleaners, Dressmakers and Alteration Work Rooms. Our industrial sewing machine catalog features: Hemming, Belt Loop, Hand Roll, Heavy- Duty Thread Trimmer and Feed Drop machines plus the only True Left Handed machine. Our industrial sewing machine catalog is available as a .pdf document and can be downloaded for your convenience. All of our machines are guaranteed and are made with pride in the U.S.A.
Sewing machine attachments and labor-saving devices are our specialty. Please contact us via e-mail: machines@nysmac.com or call us toll free 1-800-225-2852 (US only) and weíll design an attachment to help solve your manufacturing problems. Our sewing machine parts department is well stocked and ready to serve you. Our parts catalog is available as a .pdf document and can be downloaded for your convenience. We are World-Wide distributors of discontinued parts that are not available everywhere. We also have the world's largest inventory of genuine U.S. Blindstitch Machine parts.